For me, personally, darker themes make it easier to concentrate and get things done. However, like all aspects of Canonical’s system, Ubuntu is highly customisable, and thanks to a dedicated community, there is a wealth of options users can take advantage of to spice up their desktops. One operating system that has always looked beautiful is Apple’s macOS. The brand new “Mojave” marks the fifteenth release, and one of the most striking elements is the deep and rich dark theme that is known as a distraction-free way to put your work center stage. The only problem is that Linux users want both the freedom of an open-source system and a modern visually-pleasing environment. Thankfully, Gnome Look provides a number of community created themes and add-ons that can transform Ubuntu from dull to delicious! A version of Apple’s Mojave theme is available here, and it is very simple to install. There are a few prerequisites that will make life a little easier, namely to install the Gnome Tweaks tool. You can find this in the Software Center and install as normal. With that done, go to the website above and download the following package, “mc-os-mjv dark mode.” After this, extract the archive file to the “~/.themes/” directory in your Home folder. If you don’t have a .themes folder, then press Ctrl + H to show hidden files. If you still don’t have the folder, then you can simply create one. Alternatively, you can move it into “/usr/share/themes,” but remember you will need to be root to copy or extract here. 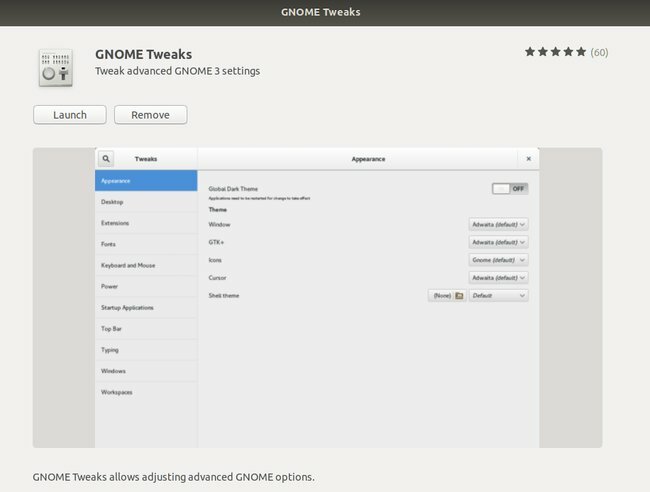 Once copied, simply open the GNOME Tweak tool and change your GTK theme. Lastly, give your system a reboot to ensure that the theme applies correctly and fully. As you can see, once the reboot is done, Ubuntu is transformed into a dark landscape with blue highlights. The theme is so well put together, that it will apply to system-wide applications (if placed within usr/share/themes) and will even alter some Snap applications. The creator of the theme has also given other desktop environments the same love, which means XFCE or Cinnamon users can experience some Apple design. As a bonus, here are some additional tweaks that you can use to change icons, add a dock and the like for the entire Apple experience. To change the icons, download the Cupertino icon set. Next, you need to locate the file you downloaded and right-click to extract it. Just as before with the theme, copy it to the “~/.icons” folder. If you do not have this, then you can create it. To create a dock, you first need to install the Plank application from the Software Center. Open the Software Center, and search for “Plank,” then install as normal. Should Plank not be found, you can revert to the PPA that the Docky/Plank team provide. To install the PPA, open the Terminal, and enter the following commands. Next, you need to download the Mojave & High Sierra Plank Dock themes. These can then be extracted as previously and moved to the “~/.local/share/plank/themes” folder. The final step is to right-click on the blank space within the dock and access the Plank Preferences. If you can’t access the right-click, press Alt + F2 and run plank -preferences. Within the preferences, look for the theme, and apply your newly installed theme. What themes do you prefer? Do you like a darker environment or prefer a cleaner, brighter desktop? Let us know in the comments along with any other great themes you have found.